We don’t have any big pumpkins in the garden this year but even if we did, there would be nothing to match this UK record beater grown by Stuart and Ian Paton. 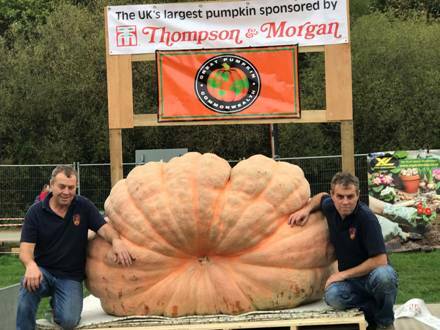 At the Autumn Pumpkin Festival in Netley, Southampton, sponsored by Thompson & Morgan, last weekend the brothers broke their record set in 2016 with a monster that weighed in at 2269lbs or 162 stone. It beat last year’s effort by 15lbs. It takes a lot of effort to grow a whopper this size – they spend 3 hours a day looking after their plants, that use 100 gallons of water a day in their polytunnel. And now the plug: Seeds of their monster are available from T&M at their website. At the weekend Mathew Oliver beat the record for the heaviest outdoor-grown pumpkin with an impressive fruit weighing 1498.4lbs. Whoa…puts our squash to shame and I thought we did well this year…Sue.